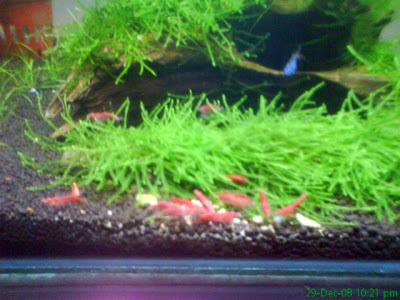 This is my red cherry shirmps.. about 10 - 15 of them, eating algae wafer. Some of the articles about red cherry shrimp, taken from Petshrimp.com. The red cherry shrimp is a red color variation of the dwarf shrimp Neocaridina denticulata sinensis, which hails from southern China, Taiwan and northern Vietnam and which has even been widely introduced into Hawaii. The red variety of the shrimp was originally bred in Taiwan. The red color variation of N. denticulata sinensis does not occur in the wild. The red coloration of this shrimp depends on several factors such as mood, water conditions and food. Hence, when these shrimp first arrive in new aquaria after shipping, they have very little red on their bodies and most animals are extremely pale. The red coloration returns with time and when the shrimp finally settle in, they maintain their red coloration at all times. Young animals also need quite some time to become fully colored out. Females who are carrying eggs are especially deep red, whereas males tend to be much paler than females . However, females start carrying eggs before they are fully colored up.